Renowned actor Anu Kapoor of the film industry has worked in many films and TV serials. 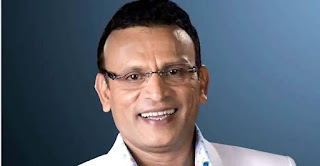 Actor, presenter and singer Annu Kapoor is among the Bollywood actors who have reached this stage on their own talent. Born on February 20, 1956, Annu made his identification with singing reality show 'Antakshari'. His father used to run the Parsi Theater Company there. Who went to the city-city and performed on the street-nook Anu Kapoor's mother was a classical dancer. Not only that, his mother taught at a school on a salary of 40 rupees. Annu Kapoor planted a tea stall for the financial help of his family. When this was not done, then used to sell churan's notes. Also, Annu used to sell lottery tickets. With this, he took admission in Delhi National School of Drama. During the play in a theater, Annu Kapoor played the role of Buddha, 70, at the age of 23. To see this drama, filmmaker Shyam Benegal also reached there and he liked the performance of Annu and only after that Annu Kapoor started his career with Shyam Benegal's film 'Mandi'. In addition to the films, Annu Kapoor hosted several TV shows. The TV show 'Antakshari' is one of their memorable shows. At present, actors host the show 'Suhana Travel with Anu' at 92.7 Fm. This is a daily show. He has also been honored with the Filmfare Award and National Award for playing the best role of Dr. Chadha in the Hindi film Vicky Donor. He has made a great impression in many other films too.